ArcGIS for Server running in the background facilitated providing ArcGIS database information as publicly available web resources. The Government of Canada prides itself on providing services and programs to all Canadians. To ensure that online services can be accessed by blind and partially sighted users, the federal government adopted the Common Look and Feel (CLF) Standard in May 2000. The standard was updated in January 2008. However, by 2008, many federal departments failed to meet their own standard—47 departments failed an audit, of which 22 seriously violated the CLF Standard. 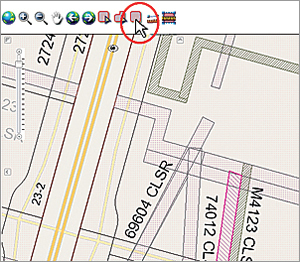 All elements of the Canada Lands Survey System (CLSS) Map Browser are accessible to blind or partially sighted people, including all buttons, tabbed menus, entry and drop-down boxes, and Esri's map itself. Another pivotal event that spurred the strict enforcement of the CLF Standard was the accessibility challenge to federal websites filed by Donna Jodhan of Toronto. She is legally blind and is a sophisticated computer user. Despite being computer savvy, Jodhan was unable to access the federal government's informational and transactional services online. She sued and cited five examples of inaccessible online services, and in November 2010 the Federal Court agreed with her. Replace the pointing device with keyboard input for map navigation, since use of a pointing device requires the user to see and manipulate an on-screen cursor. Blind or partially sighted people may or may not be able to use a pointing device. However, they usually have no problem using the computer keyboard. Allow features of interest to be selected without the use of a pointing device to trigger a spatial query of those features, and then to present the result back to the user in an intelligible fashion. Sighted people use the computer's pointing device to accomplish both tasks—map navigation and spatial queries. To accommodate blind and partially sighted people, the branch employed graphical user interface elements in combination with screen reader software that intercepts information as it is being sent to the computer screen and then renders it into speech or Braille for blind and partially sighted people. To enable blind and partially sighted people to navigate, the branch used drop-down menus that permit users to choose one value from a list of jurisdictions at the first level and another drop-down menu to choose one value from a list of units at the second level. With the screen-reader software, these graphical user interface elements can be readily used by blind and partially sighted people. Thus, regardless of input method—pointing device, keyboard operation, or drop-down menus—users are able to navigate to a particular unit of interest. Providing users with the option to select features within the current map extent empowers users to spatially select features without a pointing device. To provide blind and partially sighted people with the ability to select features on a map without an appropriate input method—that is, spatial queries—seemed to be a bigger hurdle. However, the branch implemented a solution that employs a button to trigger the spatial selection of all features covered by the current view extent (the area visible on screen after zooming in). The results are then posted back to the screen, where they can be reviewed by the user with the screen reader. If the resultant selection set of features is too large, then the user can refine the view area with further zoom/pan operations. Potentially, many features of different types could be selected using this approach, which may overload the user's capacity to interpret the information. To structure the returned information, the selected features are returned by subject, where the records of each subject are listed under individual tabs in a tabbed view. The results in each tabbed view are fully navigable using the pointing device or keyboard operations and are, therefore, fully accessible to everyone. Furthermore, if a candidate record has been determined by the user, it can be activated with a keyboard stroke to navigate to its location. For example, a user can read (visually or through a screen reader) all text in the tabbed results view and can readily zoom further in to any feature by activating its hyperlinks. Of course, the application also permits feature queries based on attribute values entered in query boxes. Development of the application was greatly facilitated by the use of REST endpoints that are generated by the branch's ArcGIS for Server running in the background. The REST endpoints provide a convenient conduit between the spatial/attribute database information and the custom-made web application. The REST endpoints provide ArcGIS database information as publicly available web resources while shielding the database itself from outside use. 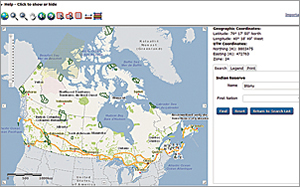 Since the Canada Lands Survey System (CLSS) Map Browser was launched in 2012, the application has been reviewed and approved by accessibility experts in Canada for accommodating the needs of blind and partially sighted people. The site receives about 2,000 hits a month. Gido Langen is a geomatics officer with the Surveyor General Branch of Natural Resources Canada. He received his MSc in 1990 and worked in the utility and private industries, for nongovernment organizations, and now the federal government. Along the way, he has taught GIS classes as a part-time instructor for the last 15 years. Brian Ballantyne is senior adviser for Land Tenure and Boundaries. 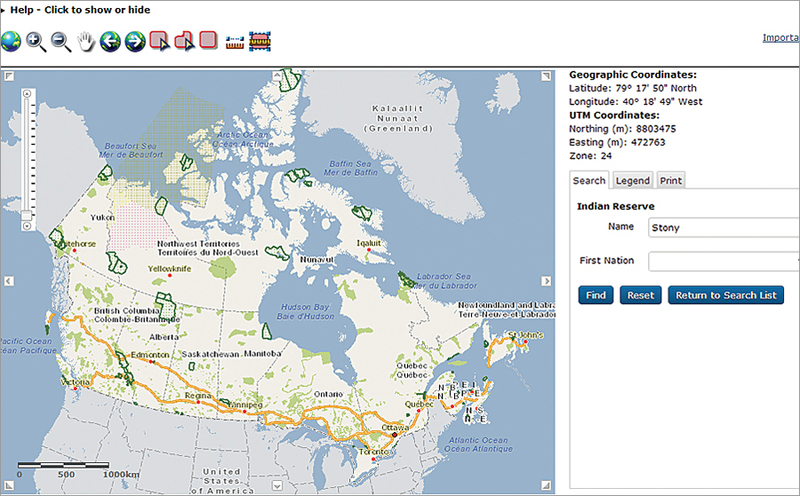 For more information, contact Gido Langen, Surveyor General Branch, and visit Canada Lands Survey System's Map Browser.